123 in stock Need More ? 30 cm 64 p. : ill. It is generally thought that hands and feet are the hardest parts of the body to portray effectively in drawings, paintings and sculptures. Giovanni Civardi demystifies the process of capturing both with this inspirational, easy-to-follow guide. Using pencils, charcoal, pastels, pen and ink, watercolours, felt pens and more, Giovanni teaches the importance of observation and sketching, and how to capture life and movement. 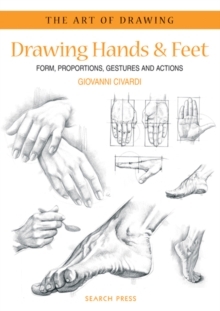 He shows how to simplify the hands and feet of children and adults, with illustrations and an easy-to-understand section on the importance of anatomy and proportions. Further explanations about light, shade and tone give helpful advice on capturing the essence of the drawing. Many different techniques are included, from the linear method where the contours of the shapes are sketched, to the structural method where the main areas are emphasised. For anyone interested in the figure, this book is invaluable. It is packed with information, quick sketches and more elaborate works.